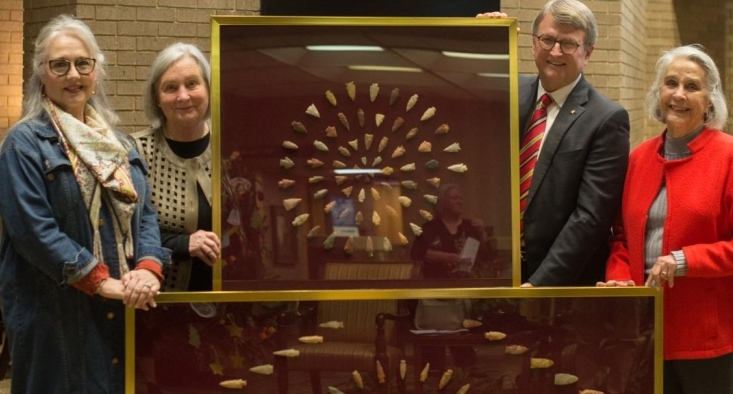 Renasant Bank has generously donated a significant Native American chipped stone tool collection back to the Chickasaw people through the Chickasaw Inkana Foundation. The Foundation is in the planning process to create a Chickasaw Heritage Center in Tupelo, MS. This framed collection of more than 300 complete chipped stone projectile points was gathered locally in the mid-twentieth century in the Chickasaw Old Town Creek valley and surrounding areas. The collection represents local types of throwing spear points, knives, scrapers and a few actual arrow points, which together reflect more than 8,000 years of Chickasaw Homeland history, culture and flint-knapping skills. The collection has been appraised by retired archaeologists, Sam Brookes and Brad Lieb, at a significant value, which is tax-deductible as a charitable donation. The artifact collection consists of seven frames of chipped stone tools, primarily projectile points, knives and scrapers. There are a few small triangular arrow points of the Mississippian and later periods, however the vast majority are Archaic and Woodland period throwing spear points are from thousands of years ago, and they are made for use with an atlatl or spear-thrower stick. The Chickasaw Inkana Foundation is a 501(c)3 nonprofit organization located in Tupelo, MS, whose mission is to preserve, protect and interpret Chickasaw History and Culture in the historic Chickasaw homeland. We thank Chickasaw Inkana Foundation member Amy Powell Riley for her help and assistance in making this important gift a reality. 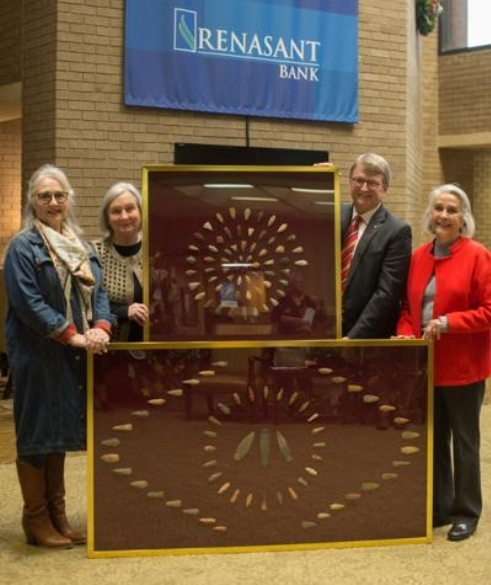 Responses to "Renasant Bank donates Native American artifacts to Chickasaw people"